America is in a desperate state, and it is not just because of Donald Trump. He is a symptom of a corrupt fascist system whose puppeteers believe in elite privilege and corporate rule, and dog-eat-dog competition that impoverishes people and destroys families and communities. Make no mistake about, this abhorrent behavior isn’t limited to the GOP. We have, since the late 90s, watched the total disintegration of the Democratic Party into a corrupt, festering cesspool of unbridled power and dirty money. There is no difference. Before we can make any real change, we must face the facts and stop believing in false narratives. It is clear that, while we do not all agree with the specific tactics necessary to effect real transformation in our government, we recognize that we must band together in this battle for the common good. To this end, we are calling for a National Strike on May 1, 2017, known and celebrated around the world as International Workers Day. This day commemorates the Haymarket martyrs, who fought for an 8-hour day and defended workers’ and union rights. We know we are being lied to about taxes funding anything on a national level. Our currency is sovereign. We don’t just use the money. We produce it. We have enough money to take care of what the people need, including health care for all as a right, good jobs for all at a decent living wage, and free education. They have no shortage of money when it comes to waging war; they run into financial problems when it comes to taking care of us. Our elected officials must understand that if they do not spend on we the people, they will be voted out. Unions must stand up against “right to work” legislation, which is nothing more than a transparent attempt at union-busting and an assault on workers’ wages. Yet, conservative union leaders still believe they can work with Trump, while other leaders believe that the Democrats – in spite of their dismal track record – will save them. 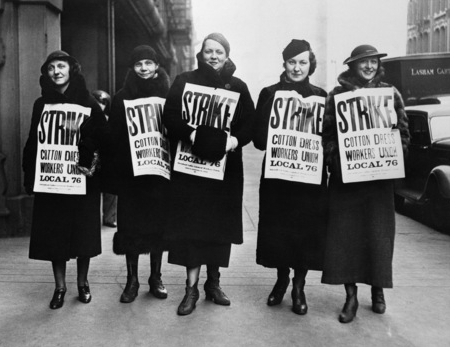 History has shown that unions are saved by the workers themselves, not by labor leaders. It is up to us to put the pressure on from the bottom up. Immigrants are being unfairly scapegoated as the cause of Americans losing jobs. We know better. We know that it is because of the greed of the corporate state that disastrous trade agreements, like NAFTA, have resulted in American jobs being outsourced overseas. We also know that American corporations are exploiting undocumented workers here at home by paying them slave wages. Make no mistake about it: We are in this situation because we have legislators who do not legislate. They have not been able to pass comprehensive immigration legislation for decades now. We believe in comprehensive immigration reform, but we demand that every undocumented person currently in this nation be offered a path to citizenship. They should not be made to suffer because our government does not do its job. We believe in a new direction for this country that puts the needs of the majority above the wants of few oligarchs that control our lives right now. We need a strong third party that is built outside the established empire, a party that puts people over profits. We cannot continue to prop up a corrupt system and expect things to improve. There will be no change coming from either established party because as long as we continue to return to them, there is no need to change. We reject the notion of endless war as a business model. We stand in solidarity against America’s imperialist interventionist aggression that seeks to overthrow foreign governments in order to feed the never-ending greed of the globalist war profiteers. They are the few. We are the many. In order for a strike to work, we need numbers. We are the many. The only thing holding us back is our belief that we have no power. In fact, we hold all the cards. They have brainwashed you into believing that. On May 1, what would happen if NOBODY showed up for work? It would be a thing of beauty. Washington would have been served notice that we the people are in power and we are in control. We can do this again if they’d like. There would be nobody to cook dinner for the elites, bathe their children, clean Trump’s hotel rooms, unload boats at the docks, run the cash registers at the local stores, drive the trucks that move the product, manufacture the product that makes the profits, and on and on. This is what a strike is all about. May 1 should be a day of disruption and mass action. Non-violent actions like shutting down highways, airports and other critical infrastructures is what civil disobedience looks like. It is not a new concept, and is a bedrock of a true democracy where the power lies with the people. We have the power to make this happen. We call on all American farmers, bartenders, auto workers, steel workers, dock workers, waitresses and waiters, fast-food clerks, bank tellers, truck drivers, pilots, cooks, teachers, clerks, mailmen and the unemployed to join the fight for the common good.